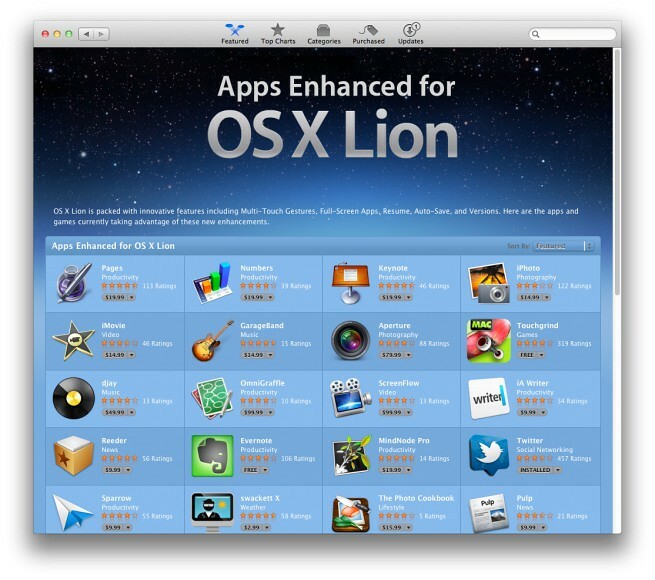 Cnet notes a new section just hit the Mac App Store called Apps Enhanced for Lion. Apple was a good sport too and allowed one third party app in the top two rows of apps. Update: Macrumors notes that Apple has begun selling Final Cut Pro 7 (which is likely not enhanced for Lion) the old fashioned way. We confirmed with an Apple telesales representative at 800-MY-APPLE that Final Cut Studio, part number MB642Z/A, is again available for $999, and $899 for educational customers. The product is only available through the 800-number and is not available in Apple Retail Stores or on the Apple Online Store. Final Cut Pro 7 was pulled ahead of the release of Final Cut Pro X in June but there has been some backlash among the higher end users because of missing features. Apple, for what it is worth, promised feature updates by the end of summer (which is coming on pretty fast now).